I loved the way he posed right by the “Watch for Wildlife” sign. There must have been three dozen of them, just strolling along, licking the salt off the road. 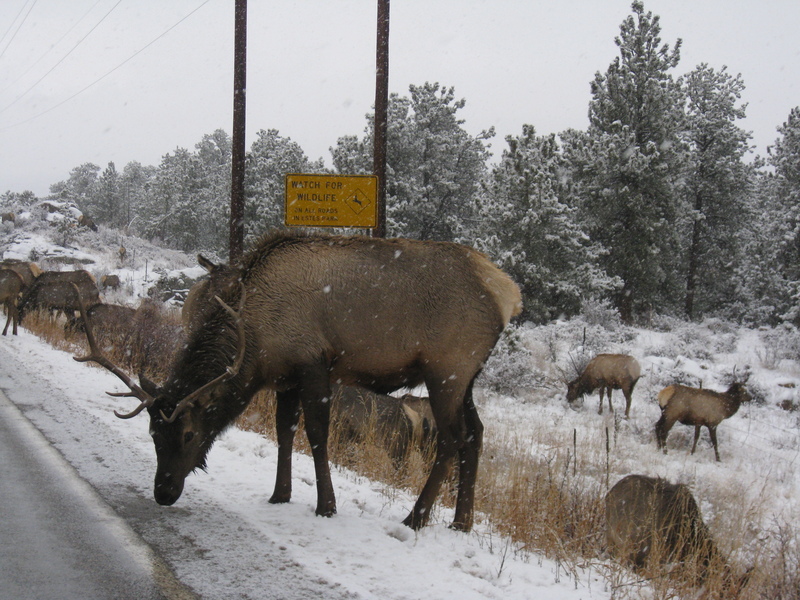 Apparently, Estes Park is good about road maintenance at the start of a light snow. We had a lovely drive up on Sunday, with the trees tipped by frost. More about our adventures at the Stanley Hotel later. We both like the energy in Estes Park and are considering it as a move option for our mountain house. But boy, does it get windy up there, and neither of us like the wind. I keep wondering how to make peace with the wind, but so far I have found no spiritual or energetic connection to it. Any ideas would of course be much appreciated. Outside of Estes Park, Colorado. Very timely photo. So unlike your seaside photos, though! I shall try, miss c.